French musician; born at Bordeaux July 23, 1838. He studied at the Paris Conservatory, where he was awarded the first prize for harmony and for the violin. He gave up a position as first violinist at the Grand Opera in order to found the Association Artistique des Concerts du Châtelet in 1874. By these concerts Colonne popularized the works of Berlioz, whose "L'Enfance du Christ," "Les Troyens," and especially "La Damnation de Faust," the one hundredth performance of which was given in 1898, were frequently rendered. He also gave prominence to the works of the younger French composers, such as Massenet, Dubois, Lalo, Vincent d'Yüdy, as well as to the masterpieces of foreign composers. The Association Artistique des Concerts du Châtelet, well known at Paris under the name of "Concerts Colonne," won signal success. 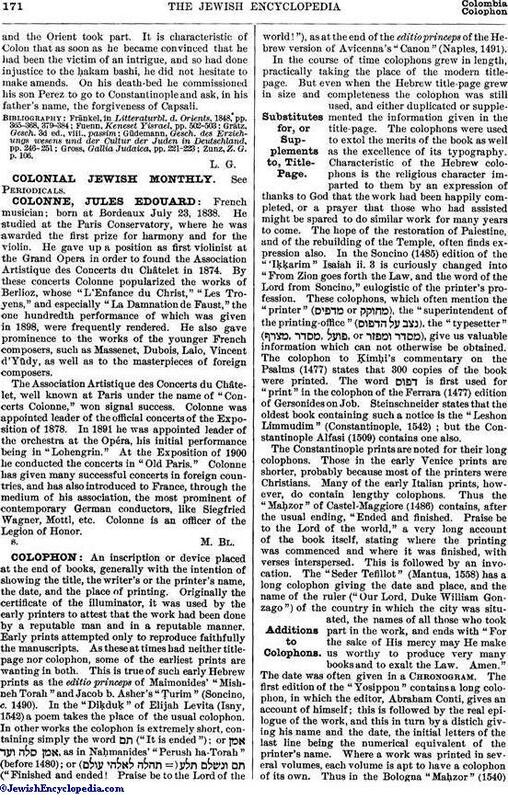 Colonne was appointed leader of the official concerts of the Exposition of 1878. In 1891 he was appointed leader of the orchestra at the Opéra, his initial performance being in "Lohengrin." At the Exposition of 1900 he conducted the concerts in "Old Paris." Colonne has given many successful concerts in foreign countries and has also introduced to France, through the medium of his association, the most prominent of contemporary German conductors, like Siegfried Wagner, Mottl, etc. Colonne is an officer of the Legion of Honor.